Clad in his orange space suit, Yuri Gagain appears pensive in this image recorded during his journey to the launch pad on 12 April 1961 (Credits: Roscosmos). In the early hours of 11 April 1961—more than five decades ago—an enormous booster trundled humanity’s first manned spacecraft to its launch site in a barren region of steppe in Soviet Central Asia. Within its bulbous nose shroud was a ship called Vostok, and it was planned that the following morning the R-7 rocket would blast it into low-Earth orbit, allowing its single cosmonaut, Yuri Gagarin, to complete one full circuit around the Home Planet. Within two hours of launch, shorter than one of today’s Hollywood blockbusters, it was hoped that Gagarin would be safely home, providing an enormous propaganda coup for the Soviet Union and a hard poke in the eye for the United States. Fifty-three years ago today (12 April 1961), a new era began. At 5:30 a.m. Moscow Time, on a day now universally known as Cosmonautics Day, 12 April 1961, Chief Designer Sergei Korolev and his head of medical preparations, Vladimir Yazdovsky, woke the two cosmonauts. After washing, shaving, and a breakfast of meat puree and toast with blackcurrant jam, doctors glued sensors onto their torsos and sent them off to don their pumpkin-orange space suits. 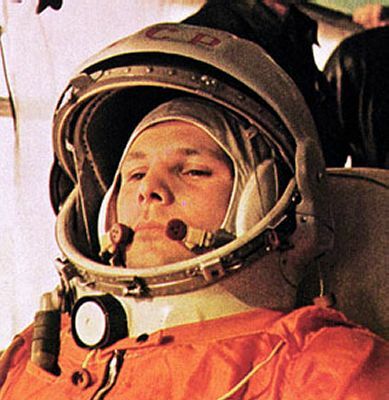 Titov got into his suit first, in order to reduce Gagarin’s time overheating in the uncomfortable garment. As he continued his own suiting-up, Gagarin realized for the first time that he was—or soon would be—the most famous man on Earth. In his heavily censored account of the mission, The Road to the Stars, he recalled technicians offering him slips of paper and work passes on which to sign. Titov beheld this and wished Gagarin luck, although he was disappointed and considered his role as hopeless. “He was commanding the flight and I was his backup,” Titov said later, “but we both knew, just in case wasn’t going to happen. What could happen at this late stage? Was he going to catch the flu between the bus and the launch gantry? Break his leg? It was all nonsense! We shouldn’t have gone out to the launch pad together. Only one of us should have gone.” Vladimir Yazdovsky, who was aboard the bus and gave him the order to remove his suit as soon as Gagarin was strapped inside Vostok, recalled Titov’s tension. Much tradition surrounds Gagarin’s trip to the pad, including, famously, his need to relieve himself through his suit’s urine tube against the tires of the bus. Unable to share the going-away custom of kissing three times on alternate cheeks, he and Titov merely clanked their helmets together in a sign of solidarity. After reaching the top of the gantry, Gagarin maneuvered himself into his ejection seat. Senior engineer Oleg Ivanovsky and chief test pilot Mark Gallai tightened his harnesses and plugged his suit hoses into Vostok’s oxygen supply. After giving him a good-luck tap on his helmet, Ivanovsky motioned for Gagarin to lift his faceplate to inform him of three significant numbers. Since the beginning of their adventure in space, the Soviets had operated their machines through on-board systems controlled exclusively from the ground and, for a time, considered that manned missions should be undertaken in the same way. What would happen, wondered the medical experts, if a cosmonaut went mad in orbit, overcome by a profound sense of separation from his home planet? Guidance, it was decided, must be automatic. However, if the cosmonaut’s sanity and devotion to the Motherland could be demonstrated, and if he needed to assume command, a six-digit keypad was provided to unlock Vostok’s navigation system, disengage it from the automatic controls, and allow him to fly the ship. The three-digit combination for the keypad would be radioed to Gagarin if ground staff considered him sane enough to take over. Yet the logic was questionable: What would happen if Vostok lost attitude control or its radio went dead and communications were impossible? Instead, a face-saving measure was adopted, whereby the three-digit code would be kept in a sealed envelope aboard the spacecraft, ready for the cosmonaut to open if needed. Gagarin’s ability to open the envelope, type in the numbers, and activate the keypad would supposedly “prove” that he had not lost his mind and was fully aware of his actions. “It was a dangerous comedy,” Ivanovsky recalled later, “part of the silly secrecy we had in those days.” The envelope, though, had to be placed somewhere within easy reach, should he need to get to it in an emergency, and a mentally unstable Gagarin could easily have opened it if he really wanted to do so. Mark Gallai, whose role included supervising the training of the Vostok cosmonauts, agreed, pointing out that all were qualified military pilots with experience of flying high-altitude, nighttime missions. The chance of them going mad was considerably less likely than suffering a radio failure. Consequently, betraying an official state secret and theoretically putting himself at risk of a lengthy prison spell, Ivanovsky told Gagarin the three digits: 1-2-5. To his surprise, the cosmonaut smiled and replied that his commander, Nikolai Kamanin, had already given him the combination! Assisted by the chief of rocket troops, Vladimir Shapovalov, and two launch pad staff members, the next task for Ivanovsky and Gallai was to seal Gagarin inside his capsule for liftoff. At this point, a problem reared its head. A series of electrical contacts encircling Vostok’s hatch should have registered a signal—known as “KP-3″—to Sergei Korolev and his control team in the nearby blockhouse, informing them that it was secure. Furthermore, the signal was supposed to confirm that explosive charges around the hatch could jettison it at a millisecond’s notice in the event of an emergency and enable Gagarin to eject. On the gantry, the contacts seemed fine and the enormous hatch—which “weighed about a hundred kilos and was a meter wide,” according to Ivanovsky—was manhandled into place and the laborious process of screwing its 30 bolts began. No sooner had they finished, the launch pad’s telephone rang. No KP-3 signal had been received, barked Korolev, and he demanded that they unscrew and remove the hatch. After more fiddling, it was done. This time, thankfully, the KP-3 signal came back clearly. It was now less than 40 minutes away from the projected 9:07 a.m. Moscow Time launch. Ivanovsky, Gallai, and the remaining personnel left the pad for the nearest control bunker. Vladimir Suvorov, determined to seize the most important photo opportunity of his career, stayed out in the open and would record some of the 20th century’s most remarkable imagery as the first man headed into space. Elsewhere, Gherman Titov was midway through stripping off his own space suit and his neckpiece was halfway over his head when the attending technicians disappeared to watch the launch. Meanwhile, alone in his tiny capsule, the young Soviet Air Force senior lieutenant, who had celebrated his 27th birthday and the birth of his second daughter a few weeks earlier, appeared calm, clear, and confident in his communication with Sergei Korolev. Finally, at 8:51 a.m., Korolev gruffly announced that it was time for Gagarin to seal his gloves and close his helmet visor. With steady rhythm, Korolev barked out in turn: “Launch key to ‘go’ position … Air purging … Idle run,” and, finally, at 9:07 a.m., “Ignition!” The gantry’s hold-down arms sprang clear from the sides of the rocket as its 20 engines, with an explosive yield of 1.9 million pounds (862,000 kg), roared to full power. Atop a descendent of Sergei Korolev’s R-7 booster, Gagarin begins his momentous journey into orbit (Credits: Roscosmos). Gagarin would later describe the initial sensation of liftoff as “an ever-growing din,” albeit no louder than the sounds he had experienced flying high-performance jets in his previous career as a Soviet Air Force pilot. His helmet muffled much of the R-7’s rumble, although the vibrations remained apparent. At some point, a few seconds after leaving Earth, he yelled the immortal words “Poyekhali!” (“Let’s go!”) over the radio circuit. Within two minutes, as the G loads began to build, he found it increasingly difficult to speak and would later compare the sensation to the stress of a harsh turn in a MiG. The pressure lifted momentarily as the R-7’s four strap-on boosters burned out and separated; after a brief pause, the central core of the rocket picked up the thrust and the G loads began to rise again. By three minutes into the flight, at 9:10 a.m., the rocket’s nose fairing was jettisoned from around Vostok’s ball-like cabin, giving Gagarin his first glimpse of the dark blue sky and the clear curvature of Earth as he reached the edge of space. The R-7’s core, now exhausted of propellant, finally fell away some five minutes into the flight, leaving Gagarin reliant on an upper-stage engine, which inserted him into orbit promptly at 9:18 a.m., exactly as Korolev had planned. Unknown to the cosmonaut, the core had actually burned for longer than anticipated, leaving Vostok in an orbit with an apogee (high point) of 200 miles (320 km), rather than the intended 140 miles (225 km). It added a little more height to Russia’s already-won World Aviation Altitude Record. As Muscovites arrived at work and the Western world still slumbered—figuratively and literally—a new era of human exploration had begun. Gagarin, whose heart rate soared from 66 to 158 beats per minute during ascent, had won the first lap of the space race. Although the noise and intense vibration of the R-7 was now gone, it was overcome by the steady murmur of fans, ventilators, pumps, and the hiss of static in his ears. His first experience of the state of weightlessness, properly termed “microgravity,” was hampered by the fact that he was tightly strapped into his ejection seat. However, he had purposely carried a small Russian doll as a gravity indicator and watched as it floated comically in midair. So too did a notepad and pencil. In fact, this would not be the doll’s only experience of space travel: In 1991, cosmonaut Musa Manarov would carry it on his mission to commemorate the 30th anniversary of Gagarin’s flight. As the capsule slowly rotated to avoid wasting propellant on unnecessary maneuvers and also to ensure that various sections of Vostok did not become too hot or cold, the First Cosmonaut had his first opportunity to view the world. 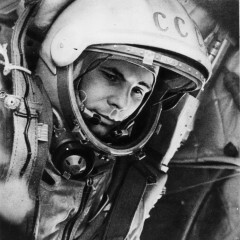 In his official statement, made in Moscow a few days later, he would describe “a smooth transition from pale blue, blue, dark blue, violet, and absolutely black … a magnificent picture.” He started jotting down observations in his notepad, but after the pencil floated away he turned instead to the on-board tape recorder to log his thoughts, describing weightlessness as “not at all unpleasant” and confirming that the food and drink were good. Leonov had been instructed not to initiate communications with Vostok unless given permission to do so, and he duly remained silent. However, within moments, Gagarin radioed a request for details of his “flight path,” keeping the orbital nature of the mission—for now—a secret from Western ears. “The radio operator by my side did not realise his finger was depressing the button that opened the radio link … when he turned to speak to me,” Leonov wrote. The open mic broadcast the words of both Leonov and the radio operator straight up to Vostok. As soon as he heard Leonov tell the operator that “everything is going fine,” Gagarin responded with “Give my regards to Blondin,” fair-haired Leonov’s nickname. The journey continued, cutting diagonally across the Pacific Ocean and toward the sleeping Americas. “The transition into Earth’s shadow,” Gagarin explained to a Moscow press conference a few days later, “took place very rapidly. Darkness comes instantly and nothing can be seen. The exit from the Earth’s shadow is also rapid and sharp.” The unexpected suddenness of the shift from orbital daytime to nighttime led to some mutterings that the flight was a fraud; a testament, clearly, to how limited humanity’s understanding of space travel was at the time. Midway through the darkness, at 9:26 a.m., Vostok rose above the horizon of the Electronic Intelligence station on the Alaskan island of Shemya, giving the United States its first awareness that a Soviet man was indeed in orbit. Admittedly, American long-range radars had detected the R-7’s launch, but it was Shemya which confirmed without doubt that live dialogue was ongoing with an Earth-circling cosmonaut. At dawn on 12 April 1961, Yuri Gagarin was an unknown in the history books. By nightfall, his remarkable achievement had turned him into the most famous man in the world (Credits: Roscosmos). The effect throughout the world, and particularly in the United States, was dramatic. Although it was known that the mission was underway virtually since its launch, and with certainty since Shemya confirmed Gagarin’s dialogue, and even though the imminence of the flight was not unexpected, the event sent shockwaves through the new administration of John F. Kennedy. Before retiring to bed the previous night, the president had displayed a sense of foreboding and his science advisor, Jerome Wiesner, had gone so far as to prepare a statement for the press. Elsewhere, in Florida, NASA’s press officer John “Shorty” Powers was awakened in the middle of the night by a journalist who had just heard of Gagarin’s launch. Powers had not. With clear irritation in his voice, and uttering words he would regret, he yelled down the phone: “What is this? We’re still asleep down here!” The journalist could not resist exploiting the figurative irony of Powers’ words. The United States and its own effort to put a man in space had indeed been caught off-guard. Next morning came the front-page headline: Soviets Put Man In Space. Spokesman Says U.S. Asleep. It was not only the world that expressed shock and disbelief at Gagarin’s achievement; even those closest to him—his family—had little or no idea of what had happened. Only his wife, Valentina, knew that he would be flying into space, although he had told her that the mission was planned for 14 April, so as not to worry her. He informed his parents that he was going on a business trip and, according to his sister, would be traveling “very far.” Upon learning of the flight, his mother’s reaction was to buy a train ticket to visit her daughter-in-law in Moscow and help care for their children. His father, meanwhile, was working on the collective farm and, after hearing that someone called Major Yuri Alexeyevich Gagarin was in space, he responded that it could not be his son, who was “only a senior lieutenant.” The enormity of what his son had done became apparent when he headed to the local soviet for more information and was quickly pushed onto the phone with a Communist Party official in Gzhatsk. Within hours, Alexei Gagarin and his sons were answering an endless stream of calls from journalists within and beyond the Soviet Union. 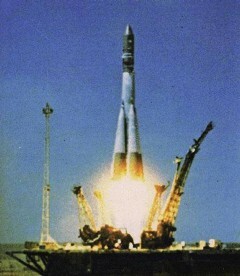 High above Earth, at 10:25 a.m., just off the coast of western Africa, near Angola, Vostok’s retrorocket fired automatically to begin its re-entry into the atmosphere. Gagarin would never need to touch his controls, nor open the envelope, nor worry about the three magic numbers. Five thousand miles still remained to be covered before landing back in the Soviet Union. However, all did not go according to plan. Ten seconds after retrofire, as intended, the four metal straps holding the instrument section and the capsule together severed, but an electrical cable failed to separate. The cable contained a thick bundle of wiring which provided power and data to the capsule. For 10 minutes, the two remained connected, with the unneeded instrument section trailing behind and causing the capsule to experience wild gyrations as high as 30 degrees per second. The incident, which was not revealed by the Soviets, but which Gagarin hinted at in his state-sanctioned report, was potentially disastrous. The capsule was weighted in such a way that it would naturally rotate to point the thickest part of its heat shield into the direction of travel. If the instrument section did not separate cleanly, the capsule could not assume its correct attitude and properly bear the brunt of re-entry heating. Gagarin could burn alive. 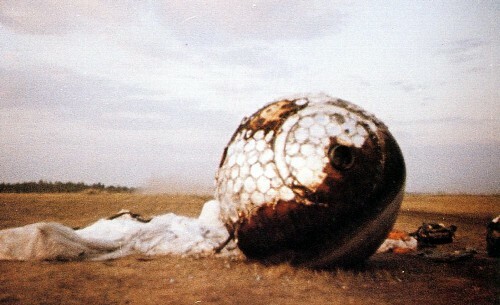 Gagarin’s Vostok-1 capsule, scorched and (it is said) heavily damaged from the furnace-heat of re-entry, had kept the cosmonaut alive for 108 adrenaline-charged minutes (Credits: Roscosmos/Alldayru.com). Fortunately, at 10:35 a.m., as the spacecraft’s meteoric descent path neared Egypt, the cable finally burned through and separated the instrument section. After slinging the capsule away with a spin so severe that Gagarin almost lost consciousness, it finally attained aerodynamic equilibrium with its heat shield positioned accurately. It was later revealed that the complications arose when a retrorocket valve failed to close properly, allowing some fuel to escape from the combustion chamber. As a result of this loss, the engine cut off a second too early, slowing Vostok at a less-than-expected rate and preventing a normal shutdown command from being issued. In the absence of this command, the engine’s propellant lines remained open and pressurised gas and oxidiser continued to escape through the nozzle and served to induce the wild gyrations. Although the engine was ultimately cut off by a timer, its lack of delivered thrust caused the spacecraft’s control system to scrub the primary sequence to separate the capsule from the instrument section. The notes of the cosmonauts’ physician, Yevgeni Karpov, auctioned by Sotheby’s in March 1996, revealed his concern, and, indeed, analysts have speculated that—had the world known of these problems—the ’60s space race might have slowed dramatically. Eventually, as he heard denser air whistling past the capsule and saw blue—not black—sky outside, he braced himself for ejection. By this point, Vostok had crossed back into Soviet territory, on the Black Sea coast, near Krasnodar. Gagarin’s ejection procedure was supposed to be fully automatic, triggered when the on-board sensors registered an outside atmospheric pressure consistent with an altitude of about four miles. He may have felt that the oscillations were too severe to risk it, and it would appear that he initiated the sequence manually. With a tremendous roar and rush of air, the hatch above his head blew away and the ejection seat’s rocket propelled him from the capsule at terrifying speed. Protected from the frigid high-altitude temperatures by his suit, Gagarin descended to Earth; his main parachute opened successfully, followed by its backup, and the First Cosmonaut hit the ground under two canopies. 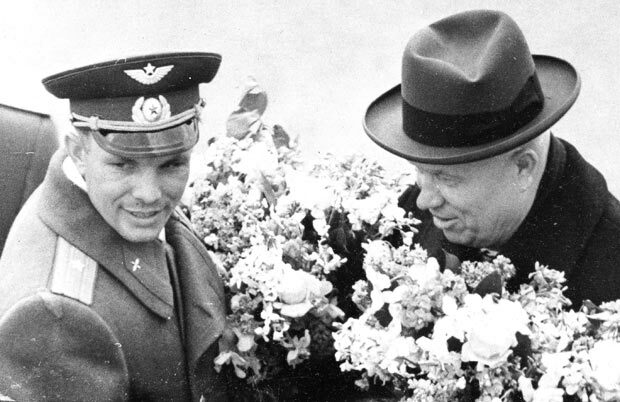 Yuri Gagarin (left) was proudly displayed to the world by a joyful Nikita Khrushchev (right), who recognized the political and ideological advantage which his flight had acquired over the United States (Credits: Roscosmos/The Telegraph). The location at which the feet of Yuri Alexeyevich Gagarin—the first human ever to break the bonds of Earth and enter space—made contact again with terra firma took place in a field some 15 miles southwest of the town of Engels, in the Saratov region, near Smelovka. Today, the site is marked by a 35-foot-tall (10-meter) obelisk and plaque, inscribed with the legend “Y.A. Gagarin Landed Here.” The formal marker was placed there on 14 April 1961, two days after Gagarin’s historic flight. However, the historic nature of the event had already led someone to erect a small commemorative signpost on the spot, instructing potential trespassers not to remove it and announcing the time of his landing as 10:55 a.m. Moscow Time. Less than two hours had elapsed since Gagarin’s launch … around the same time it would take you or me to watch an average-length Hollywood blockbuster. Tractor driver Yakov Lysenko heard, but could not see, the ejection sequence as a loud “crack” in the sky. Seconds later, he saw the Vostok capsule descending under its own automatically deployed parachute and immediately returned to Smelovka to raise the alarm. A hastily assembled search party was greeted by what Lysenko would later describe as a “very lively and happy” Gagarin, who identified himself as “the first space man in the world.” Farmer Anna Takhtarova also recalled the strange sight of the orange-suited cosmonaut telling them not to be afraid and asking for a telephone to call Moscow. Shortly thereafter, the Soviet military, under General Andrei Stuchenko, arrived in force to take over the recovery effort. Gagarin had been promoted to the rank of major during his flight and was greeted as such by one of the local officers, Major Gasiev. “It was a complete invasion force,” Yakov Lysenko said later of the military’s arrival. “They didn’t allow us to get too close. They’re very strange people.” It was understandable, at least from Stuchenko’s perspective. He had already been told in no uncertain terms by an anonymous Kremlin official the previous day that on his head lay the responsibility to safely recover Gagarin. Stuchenko obviously wanted to leave nothing to chance. The Vostok capsule hit the ground a couple of miles from the cosmonaut himself, since his high-altitude ejection had caused them to drift apart. For years, the spacecraft’s landing site was officially one and the same with Gagarin’s own, to avoid FAI suspicions that both had not touched down together. However, the Vostok site is known with certainty, thanks to a group of children who happened to be playing in a meadow near the banks of a tributary to the Volga River. They saw the capsule land. Schoolgirls Tamara Kuchalayeva and Tatiana Makaricheva described the dent it left in the soft earth and related how the boys clambered inside and began handing out and trying the tubes of space food. “Some of us were lucky and got chocolate,” Makaricheva recalled of the unusual mid-morning snacks. “The others got mashed potatoes. I remember tasting some and spitting it out.” Kuchalayeva agreed that she would not eat it again. Gagarin’s 108-minute adventure, it seemed, made him a hero not only for being the first to survive space, but also for being the first to survive the tastelessness of space food. Twenty minutes after the R-7 blasted off, cosmonaut commander Nikolai Kamanin boarded an An-12 aircraft, bound for the industrial city of Kuibishev, today’s Samara. With him were Gherman Titov, Mark Gallai, and a substantial delegation from Baikonur. Whilst airborne, they learned of Gagarin’s landing in Saratov and toasted his success with cognac. The cosmonaut, meanwhile, had already spoken with Soviet Premier Nikita Khrushchev by telephone from Engels, before heading on to Kuibishev. On the outskirts of the city, in a special dacha on the banks of the Volga, Gagarin was given a medical examination and a day’s rest before his journey to Moscow. The mission was over. Shortly, his new life as an international celebrity would begin. On 13 April, whilst still secluded in the Kuibishev dacha, he underwent his official two-and-a-half-hour interview by the Vostok State Commission—the only opportunity for “the truth” about the mission to be revealed, behind closed doors, to high-ranking officials. Although he undoubtedly described the problem with the instrument section, it remains unclear as to why this was not properly resolved in time for the next flight, Vostok 2, other than the possibility that changes were implemented, but failed to work. Meanwhile, efforts to secure the World Aviation Altitude Record had already led sports official Ivan Borisenko to hurriedly get the First Cosmonaut’s signature on FAI documents within hours of landing. In his fictitious account of the proceedings, published in 1978, Borisenko would recall “dashing up to the descent module, next to which stood a smiling Gagarin.” The reality that capsule and cosmonaut landed a couple of miles apart was kept closely guarded. After his day on the Volga, during which time he also played billiards with Titov and described his experiences, Gagarin flew to Moscow on the morning of 14 April aboard an Ilyushin-18. He had already rehearsed the half-hour speech that he would deliver to Khrushchev, but could hardly have anticipated the sheer outpouring of adoration for him. On the outskirts of the capital, a squadron of seven MiG fighters intercepted his aircraft and escorted him down Lenin Prospekt, Red Square, and along Gorky Street to Vnukovo Airport, where the Il-18 touched down just a few hundred feet from Khrushchev’s flower-decked reception stand. The premier congratulated Gagarin, announcing that “you have made yourself immortal because you are the first man to penetrate space.” Following the party line, the First Cosmonaut responded by challenging the “other countries” to try to catch up with superior Soviet technology. 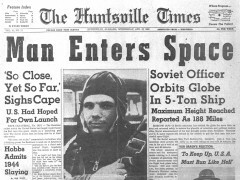 The dramatic impact of Gagarin’s flight is highlighted by the front page of The Huntsville Times. It should have been a time of celebration for all humanity, but political relations between the United States and the Soviet Union were at a low ebb and the immediate reaction was how to respond to this Communist challenge (Credits: The Huntsville Times). Nonetheless, within hours of the flight, NASA Administrator Jim Webb appeared on American television to congratulate the Soviets and express his disappointment, but also to offer reassurance that Project Mercury—the United States’ own man-in-space effort—would not be stampeded into a premature speeding-up of its schedule. His remarks did little to dampen the fury of the House Space Committee, which verbally roasted both Webb and his deputy, Hugh Dryden, on 13 April. It made no difference; the Soviets had won the first lap of the space race, and John Kennedy, still only months into his presidency, had to respond with something spectacular. Faced with persistent questions from Congress as to why the United States should remain in second place to Russia in space, together with a perceived “gap” in missile-building technology, Kennedy knew that Project Mercury’s first manned flight would not even match, let alone surpass, Vostok’s achievement. Indeed, it was unlikely that a single-orbit piloted mission could be attempted before the end of 1961, so temperamental was the new Atlas launch vehicle needed to achieve such a feat. By that time, the Soviets could well have pushed their lead even further. A goal on a longer-term basis, with an above-average chance of success, was crucial for America’s young president. On 14 April, Kennedy called an informal brainstorming session with several aides to discuss suitable space goals. Landing a man on the Moon emerged as the best option to draw the Soviets into a race which the United States could conceivably win. Not only would it convey a message to the world of American technological prowess, but it would clearly beat Russia. A few days later, however, circumstances on a Caribbean island just southeast of Florida made Kennedy’s need for something—anything—to bolster his administration even more urgent. That “something” was announced by the young president before a joint session of Congress, on 25 May 1961: the goal to land a U.S. astronaut on the surface of the Moon, and bring him safely back to Earth, before the end of the decade. It was an audacious goal, particularly as the United States’ first manned space mission had not even achieved orbit, carrying Alan Shepard on a 15-minute suborbital flight on 5 May. Kennedy’s motivations for announcing the lunar goal have been debated endlessly over the years, and it is certain that his decision was governed in part, if not wholly, by politics and the need to stress U.S. technological prowess and ideological muscle, but whatever led him to target his nation’s resources toward a Moon landing owes everything to the flight of Yuri Gagarin. For without Gagarin’s incredible bravery and gusto on that April day in 1961, it is certain that history would have played out differently. Maybe a human being would have set foot on the Moon. But almost without doubt, it would not have happened as soon as it did … and that draws us to respect Gagarin for two reasons: firstly, for being the first of us to venture into space, and secondly, for setting our feet on the path to even grander goals.